Do you like Ice cream sandwiches but your diet says no? Well then how about a yogurt sandwich instead? Since being on Nutrisystem I have learned to make healthier choices in what I eat. 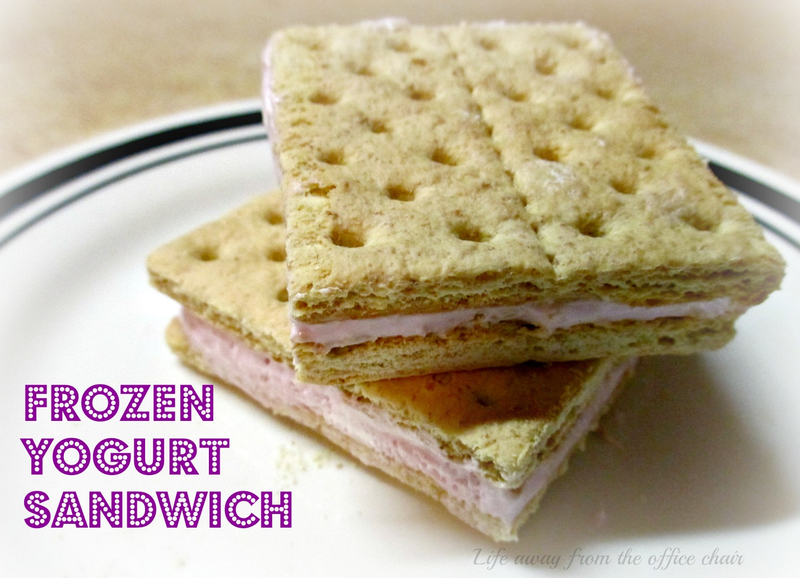 These little frozen goodies are healthy, delicious and less than 100 calories each. They are easy to make and fit right into your diet without any guilt. If your not on a diet, then you can just eat all you want and not regret it. 8- Low fat graham cracker sheets (note: each cracker sheet has 4 triangles). 1- Low fat, 80 calorie yogurt (flavor of your choice). Mix the yogurt and cool whip together. Lay 4 crackers sheets in a single layer in a shallow dish. Top with 4 cracker sheets..
Only 92 Calories per square. Go ahead and experiment with different flavors. I think lemon would be good. You can add nuts or spinach. Yes spinach. Just like you would a smoothie. It may turn a pretty green but you will not taste it in there. Really. PS: After freezing overnight, they got really hard so you may want to cut and separate after about 4 hours. Wrap each individual sandwich in foil and place back into the freezer to enjoy anytime. Such a great idea! Can't wait to try! Looks yummy and simple too. How clever is that! And yogurt is healthy. Great post! This looks like my kind of sandwich, I put my yogurt on cookies and waffles all the time, your sandwich is awesome! Thanks so much for sharing with Full Plate Thursday this week and come back soon!